Before I became obsessed with laser cutting I was a stone lithographer. 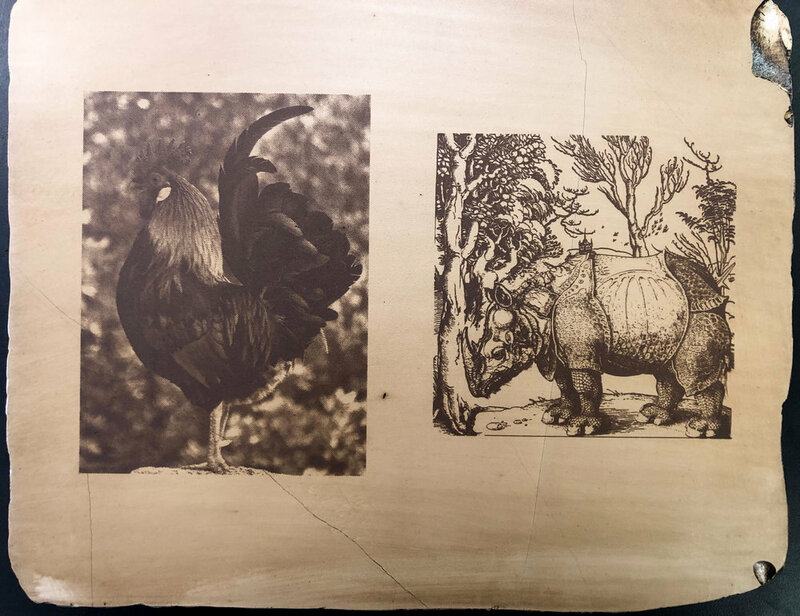 In its day, lithography—which uses a printing method where greasy drawings are created on and printed off of blocks of limestone—was cutting edge technology. My obsessions have changed with the times. Like other artists today, I am finding ways to merge traditional printmaking methods with new technology, including laser cutters. 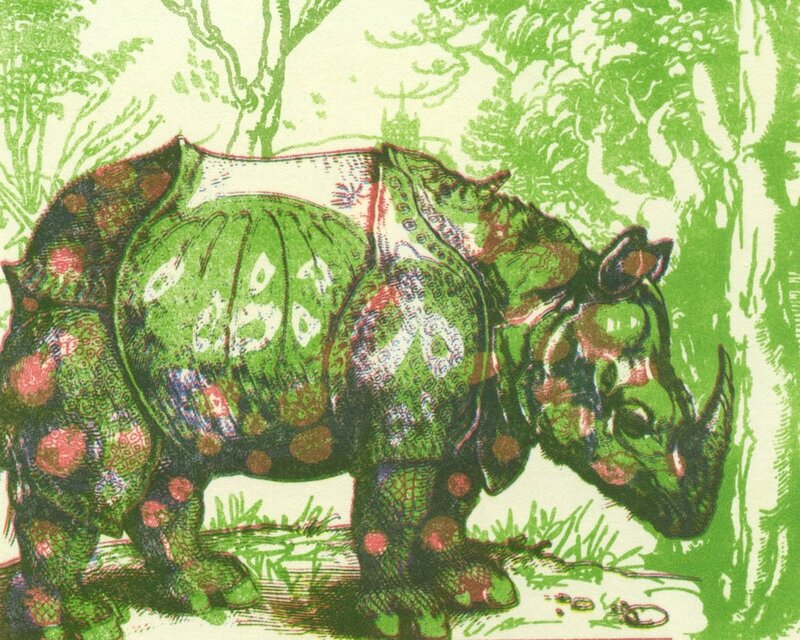 At the SGC International printmaking conference in Dallas, my collaborator Michael Smoot and I spoke on a panel I organized about laser engraving techniques for lithography or, as we like to call it, "laser-litho." We were joined by my panel co-chair Brendan Baylor and fellow panelists Miguel Aragon, Phyllis Merriam, and Michael Stradley, who addressed different ways printmakers are incorporating CNC technology—laser cutters, CNC routers, 3D printer— into their work. 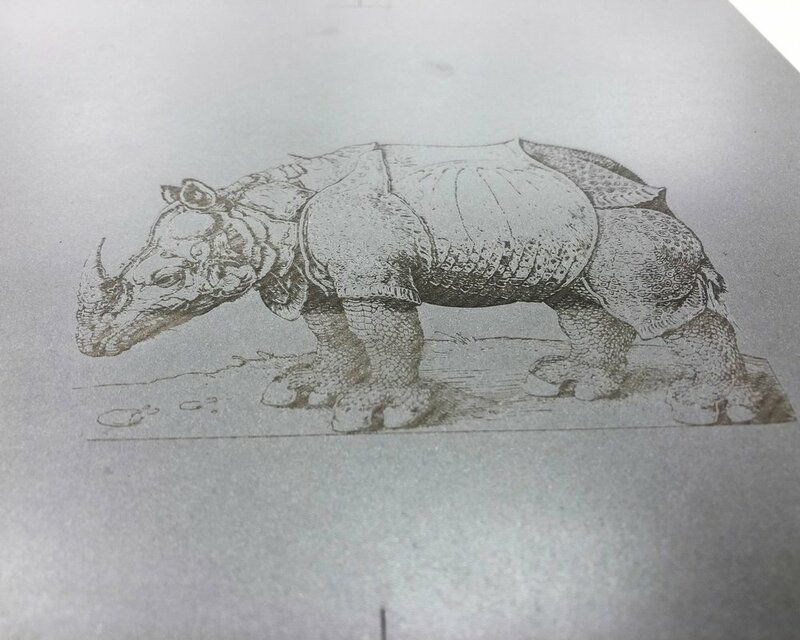 When I began conceiving of this panel, I went searching for someone who was combining laser engraving with lithography. When I couldn’t find anyone, I decided to find a fellow lithographer to partner with and do the research ourselves. And that's how Michael Smoot and I began our collaboration and how "laser-litho" was born. Michael and I started our experiments with a small litho stone and metal ball-grained plates. With the litho stone we buffed in a thin layer of gum Arabic. The gum Arabic acts as a resist, protecting the stone. We then laser engraved into the stone, which removed the gum layer from select areas. Next we rubbed greasy ink into the exposed areas to set the drawing into the stone. This method worked quite well for line and area engraving, though in later experiments we were reminded of one important factor—natural variation. Litho stones are a special type of limestone found in Solnhofen, Germany. While they are prized for their fine-grain and homogeneous makeup, they vary in hardness. As a result, the laser engraving settings that work well for a hard stone will engrave too deeply on a soft stone. That's why it's important to test each stone for its optimal setting. Traditionally when artists wanted to delete an area of a drawing on a stone, they would use a hone, an abrasive material that acts as an eraser. The laser cutter can also be used as a hone to remove drawing material from the stone. (Boy, would this life hack have come in handy years ago when I was working on a series of architectural prints!) Laser engraving allows for the removal of fine detail and the creation of sharp edges. It can also produce fine photographic images. You may be wondering how heavy a stone you can put in a laser cutter. For my Universal VLS 6.60 the answer is 40 pounds. Ideally you don’t want to be moving the laser cutter bed up and down too much when the stone is on the bed, as it will wear down the hydraulics. One of the stumbling blocks that came up in our first experiments was that laser engraving isn’t effect on ball-grained plates due to the laser’s inability to engrave away a thin layer of metal. Here is where having a collaborator is so important. I’ve never been a fan of metal plates because you can’t take a hone to them, but Michael, who's worked with metal plates more than I have, wasn’t ready to give up on them. Question: What kind of metal plate has a coating that can be removed by the laser? 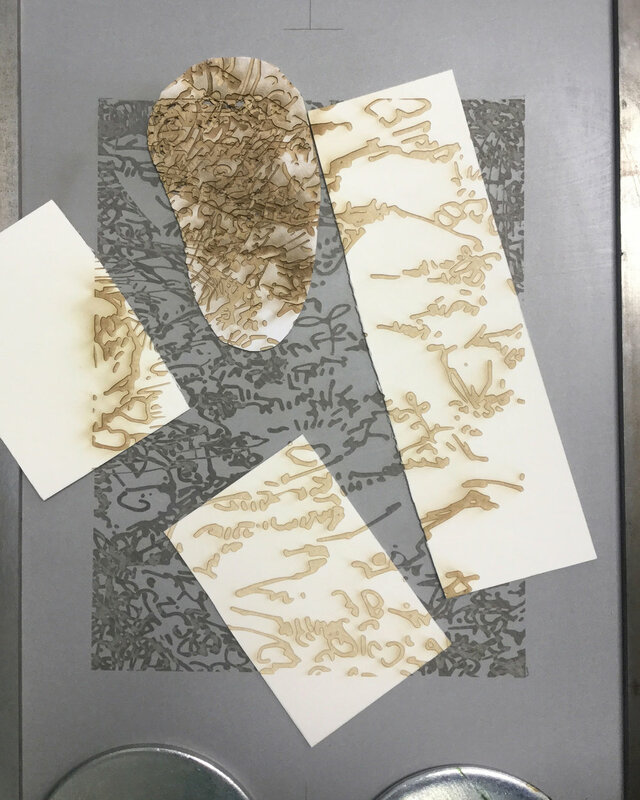 Waterless litho plates are created by applying a thin layer of silicone, thinned with mineral spirits, onto a metal plate. When ink is rolled onto the plate the silicone resists the ink, preventing it from sticking to the non-image area. Michael and I discovered that we could create an image by laser engraving away the silicone, thereby exposing the raw plate below that we could then be ink up. The beauty of this method is that you can go into the plate both subtractively (laser engraving) and additively (applying more silicone), almost indefinitely. It reminds me of master printer Ernst Hanke’s method of creating multi-colored stone lithographs, using only one stone. To see Ernst’s method in action, check out his collaboration with Patrick Wagner and the drawing robot. 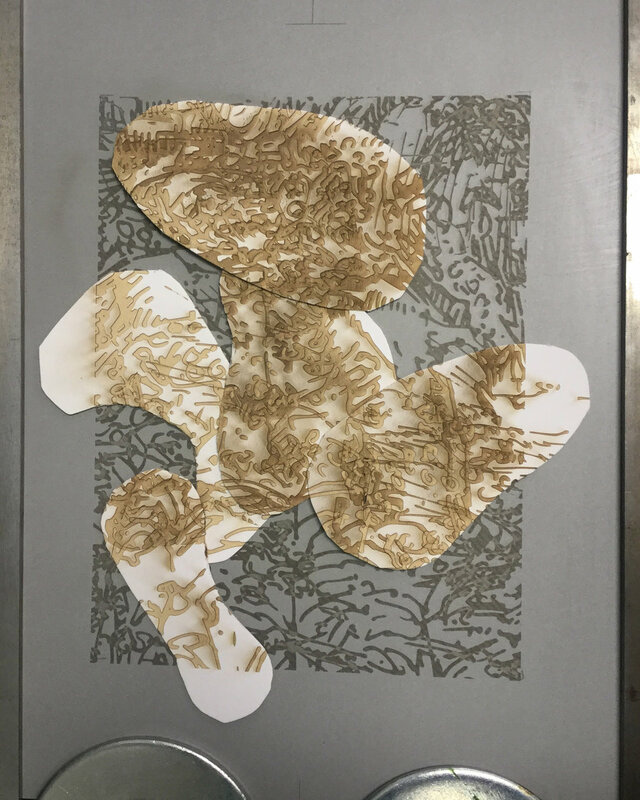 Two of the advantages of working with waterless litho plates is the method is low-toxic and the plates are portable. On a logistical note, Michael and I, who live two hours apart, created the print below by mailing the plates back and forth to each other. One of the challenges that comes up for me when working digitally is that the creative process can become stagnant. I find the straight-line approach of creating a file that is then directly outputted uninspiring. There is no push back from the medium because I have total dominance and have made all the decisions before I press "play" on the laser cutter. For this reason, in my own studio practice I often compose images through a “working at the press” method, that is, creating the image through the process of laser cutting by working with multiple files at a time. The final physical image does not exist digitally. Let me show you. For this waterless litho plate, I created the image using four files of drawings from my sketchbook. Before engraving the first drawing I covered areas of the plate with mat board to establish areas where the image did not engrave. Then I rearranged the mat board pieces and engraved the second drawing, repeating the process for the third and fourth drawings. Mat board is thick enough to prevent the laser from engraving into the plate, but at a certain point the mat board becomes thin in areas and accidental engraving comes through… and herein lies the serendipity! The result is a plate that is more dynamic than something I could have created digitally and, because of the element of chance, I was able to break away from habitual compositional forms. The preliminary research Michael and I have done in laser-litho is just a starting point. There's more to explore with stone lithography and how the mark of laser engraving can play with hand-drawn imagery. And there's room for the portability and flexibility of laser engraved waterless litho plates to be combined with other print media and collaborations. Are you intrigued enough to start exploring these techniques? Drop me a line and show me what you discover. Thank you for subscribing to Adventures in Laser Cutting. I’m looking forward to staying in touch and sharing my new discoveries with you.